Some of the people attending the CUTC are (l-r) Gary Wheeler and Gary Clark, both with Missouri Corn Growers and Jamey Cline, BBI International. They’re all Missouri boys. 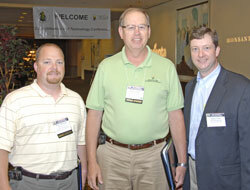 In fact, MO Corn Growers is one of the sponsors here at the conference. I got them all to talk with me a little about the event with their impressions and observations. Some of the things that they mentioned included getting good information, especially on the supply side of things and also with distillers grains as well as new enzyme technology. They all agree that this is a very timely conference for the industry since we’re seeing a lot of change and ideas presented here will help us prepare for the changes of the future.